and ask for the Sales. Dril-Quip offers the PR-80™ and FRC™ Production Riser Connectors as an integral part of the entire production riser string system for Spar and TLP vessels offered by Dril-Quip. Dril-Quip’s FRC Flanged Riser Connectors are preloaded connections suitable for use in TLP or Spar high-pressure drilling riser and production riser applications. 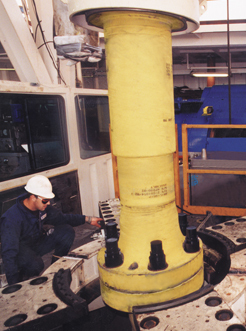 Forged heavy-duty bolts are used to make up each connection and incorporate rings to retain the bolts in the "up" position during handling. A metal-to-metal sealing ring gasket provides a gas-tight connection. 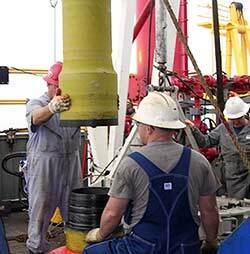 Dril-Quip’s FRC™ Marine Drilling Riser Connector combines high coupling strength with ease of operations and meets the stringent durability requirements of today’s deepwater drilling operations. 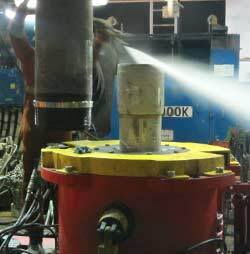 Special hydraulic wrenches ensure fast make-up and accurate preloading of the flange connectors. This quick-running, high-strength coupling is designed for easy maintenance with field replacement of most of its components. This rugged, reliable riser connector delivers maximum uptime. The PR-80 Production Riser Connector features high-tensile, high-bending and high fatigue life characteristics while maintaining easy operational features. The connector incorporates a metal-to-metal seal with an elastomeric backup.